Miss Ransley was recently recognized in the United Kingdom for loyal and devoted service to the Royal Academy of Dance UK, having acted in the capacity as an Examiner for the Academy for over fifty years – an extraordinary achievement. In 1954, Joy examined as part of her training to become an examiner (there was no formal training at that time!) then completed the full examination in 1965 - her first tour being in 1956. Joy and her sister Dawn are extremely proud of their past and present students and have witnessed their many successes as performers in theatre and stage; as teachers themselves and as members of some of the most prestigious ballet companies overseas and in the world ie Royal Ballet London, English National Ballet, School of American Ballet (New York), American Ballet School, Washington State Ballet School USA. So from the beginnings of the Ransley Ballet School in 1947 in the School of Arts Hall, Granville, Sydney, the studio continues to flourish and produce students of the highest caliber under the direction of Joy and her daughter Nicole. Joy continues, to this day, to examine world-wide, sharing her knowledge and passing on the Ransley unique style, technique and artistry to her many students. Bianca Bulle – trained with Ransley Ballet & Dance Centre since the age of ten. She was awarded a scholarship to the School of AmericanBallet, where she completed her pre-professional training. During this time she was also awarded a scholarship to train at the Royal Danish Ballet Summer School. Bianca has just been promoted to PRINCIPAL of the Los Angeles Ballet – Director, Colleen Nearey. A marvelous achievement for one so young. The Ransley Ballet & Dance Centre has had an extremely busy year with students working very hard towards their RAD Vocational Examinations and Vaganova Assessments resulting in all students receiving Distinctions and High Distinctions. Have you missed the Annual Christmas Concert? A delightful performance of the Gold Coast City Ballet at the Arts Centre Gold Coast provided a wonderful evening’s entertainment of beautiful dancing. All students were involved from our Tinies through to our Advanced students. The Annual Ransley Ballet Christmas Concert and Christmas Party was held at the Albert Waterways on Sunday 11 December. It was a huge success with all students “strutting their stuff”. After the concert, awards were given out and the arrival of Santa topped off the evening (especially for the young ones). Friends and fellow Ransley Ballet and Dance Centre students Amelia Ransley and Ava-Louise Devine, will head to New York together in the new year after being accepted into the famed Joffrey Ballet School. Ava and Amelia are the latest in line of students from the world renowned Ransley studio accepted into the prestigious school. Amelia was born with ballet in her blood. Her aunt, Nicole Ransley, and grandmother Joy Ransley, both danced with the The Royal Ballet Company in London. 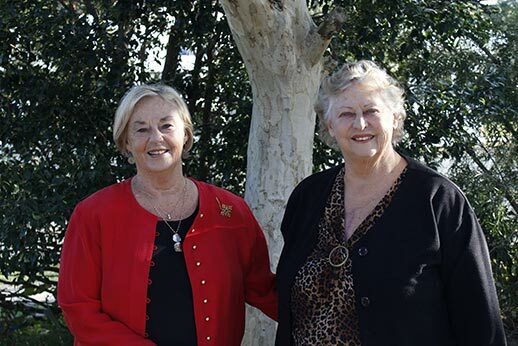 Joy and Dawn Ransley spent six decades developing some of Australia's leading ballet dancers and theatre performers before retiring in 2013 and handing the baton to Joy's daughter Nicole.